Introduction to "Lady Eleanore's Mantle"
"Lady Eleanore's Mantle" is, most simply, a story about pride. It has also been described as a tale about revolution, and as a cautionary tale of infection and disease. Lady Eleanore Rochcliffe comes to Boston from London to live in the Province House under the care of her guardian, Governor Shute. She immediately shows her prideful disdain for all those she perceives as her inferiors, including Jervase Helwyse, a young man who has fallen in love with her. Lady Eleanore is known and envied for her beauty, which is highlighted by her embroidered mantle, without which she is seldom seen. To celebrate her arrival, Governor Shute hosts a ball to which all those of importance within the colony are invited, but Lady Eleanore ignores most of the guests. During the evening, she is approached by Jervase, who has been maddened by his love for her. He offers her a goblet of wine, which she refuses, then beseeches her to cast off her mantle, which she also refuses to do. In a short time, the famed smallpox plague of 1721 hits the city, and the rich and poor, the snobbish and compassionate alike, are felled by the disease. Lady Eleanore herself is stricken, and languishes in a final judgment on her pride-a disfiguring curse that may very well have been spread by her incredibly designed mantle. 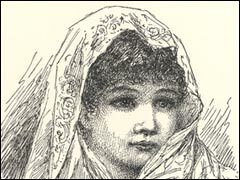 In this story, Hawthorne creates a female character who is similar to some of his other female characters, yet markedly different at the same time. Lady Eleanore is strong-willed like Hester Prynne, yet has neither Hester's pity nor compassion. Eleanore is beautiful like Young Goodman Brown's wife, Faith, but has no spirit of kindness about her. What Eleanore does have, in spades, is attitude and conceit, the hubris that leads to a comeuppance even she cannot escape. Like Alice Pyncheon, Lady Eleanore becomes a mysterious presence, ghost-like in her haunting of the Province House at the end of the tale.